Who would have thought that sleeping under the stars in a treehouse could be so luxurious? For Alex’s 25th last month, I wanted to do something really special. He spoiled me rotten for me birthday last year, organising to go to The Big Cat Sanctuary and stay in one of their lodges… well for his quarter-of-a-century-celebration I decided to stick with our wild, ‘big cat’ theme and found a truly unique lodge experience up in the canopy of a forest in Somerset (+ a day trip to Longleat Safari Park!). The idea originally came from my friend Niki, I must admit. 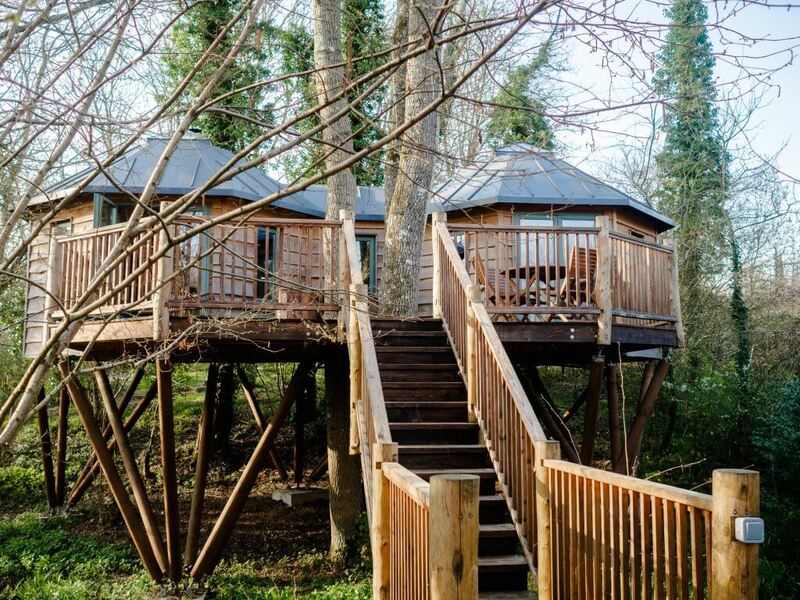 She mentioned about staying in a treehouse, and I remembered Alex mention he’d always been keen to stay in one of the VIP treetop lodges at Center Parcs… so of course I wanted to find the smaller, cuter and quirkier version of this. During my research I came across a website called Canopy and Stars, and oh my goodness – this will now forever be my ‘go-to’ for finding wild and unique places to stay. If you haven’t heard of it before, go and check it out! 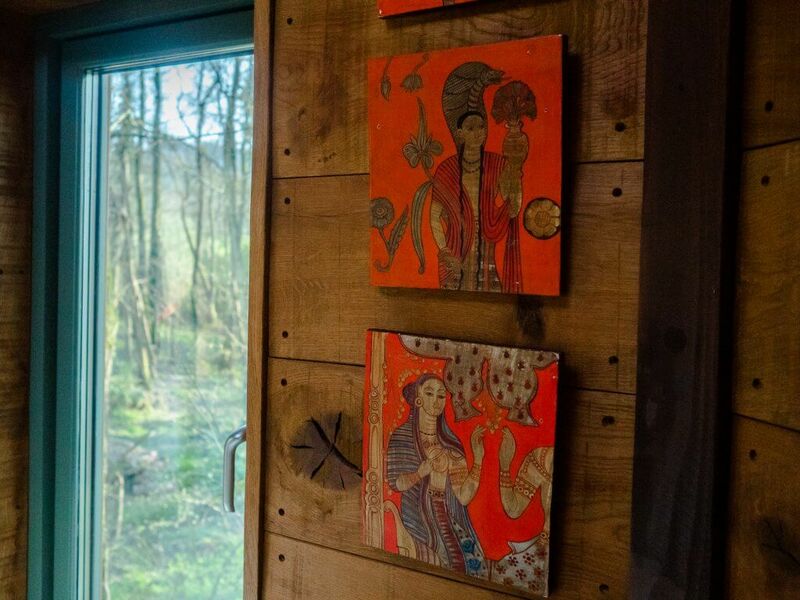 It’s full of unbelievably awesome outdoorsy accommodation across the UK and further afield too – from Shepherds Huts to Yurts and Geodomes, and of course a whole LOAD of treehouses. The constructions of which you would not believe – seriously amazing! 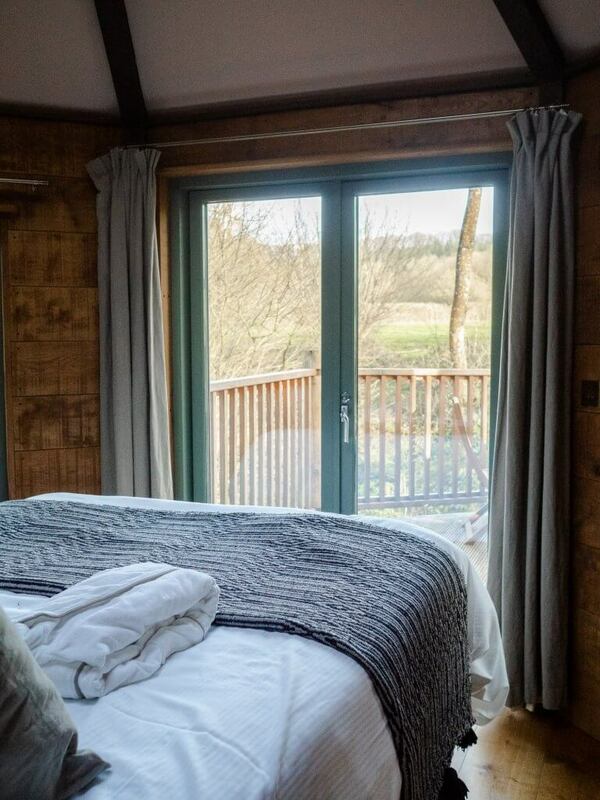 Once I fell in love with this website, I searched for a treehouse that would be available for our dates and that wasn’t TOO far for us to drive up from Cornwall. Somerset/Wiltshire sounded like a good idea, as then we’d be able to pop into Bath and (yay!) go to Longleat for the day while we were there too. I found The Bower Treehouse and booked it pretty much immediately because I was so excited. I then had to wait a whole month to tell Alex where we were heading, and we packed up to leave the next morning! Alex didn’t know what to expect at all, as we were driving into the forest of the Stourhead estate. When we pulled up into the parking space outside the farm house, there was a little welcome booth with lanterns and our key ready for us, and we walked down the wood-chip path into the woodlands to find our accommodation! As we walked through the woods we could hear the sound of a babbling stream as our treehouse came into sight. 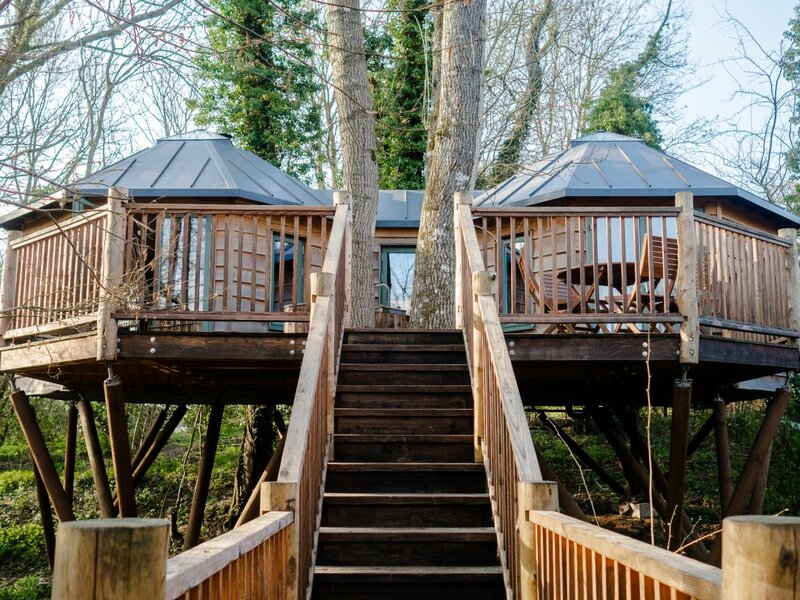 Propped up on some incredible wooden stilts and approached by a beautifully built bridge over the stream and staircase up to the decking, the Bower Treehouse definitely delivered that ‘wow’ moment! 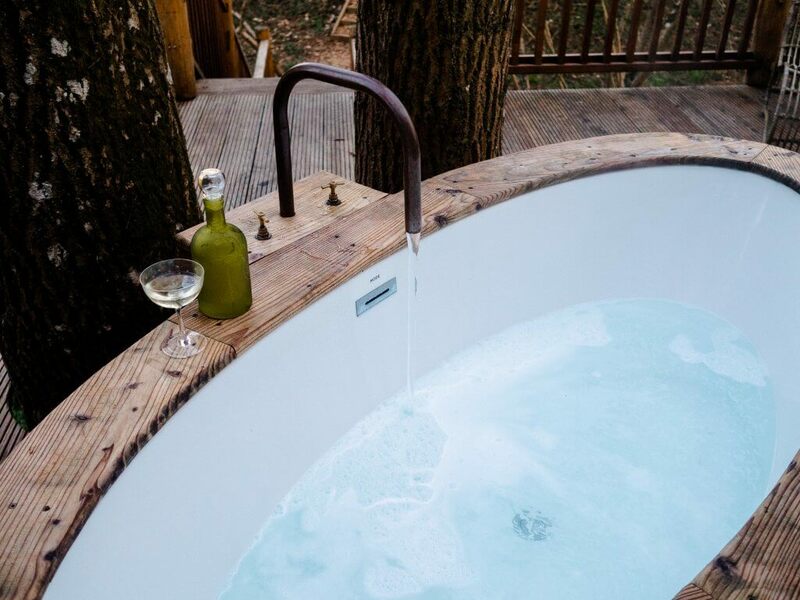 Up on deck, there was a table and chairs for al fresco dining, a boot box for muddy wellies, and of course – a large outdoor bath for ultimate relaxation! 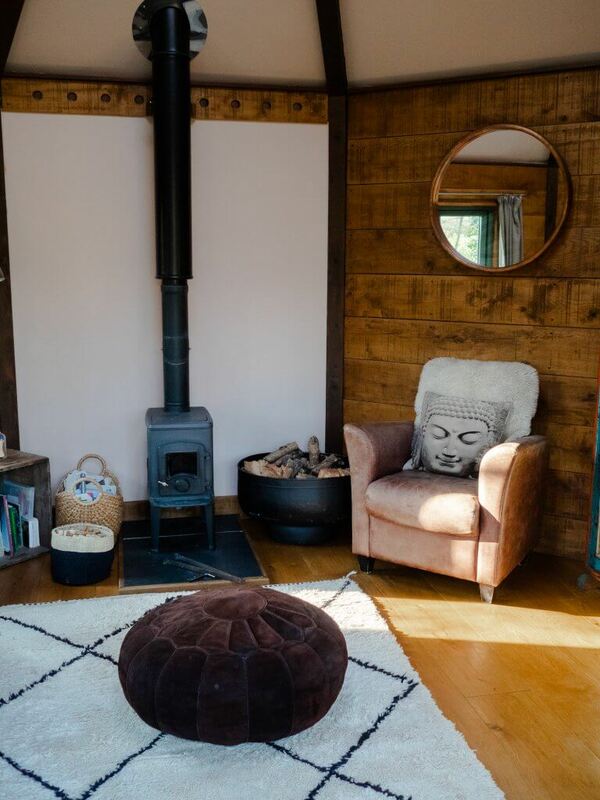 The treehouse itself is made up of two hexagonal rooms (a living room and then double bedroom with en-suite) connected by a galley kitchen, all with electric, heating and plumbing just as you’d expect a small luxurious apartment. 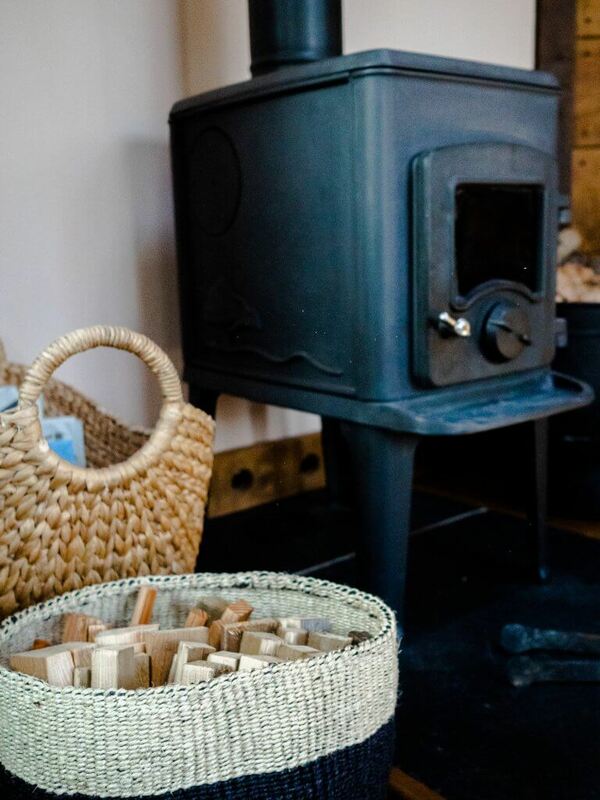 Plus an adorable little wood-burning stove that kept us cosy in the evenings. Complete with books, magazines and a host of board & card games, the Living room was the perfect cosy escape for us after our journey up from Cornwall. 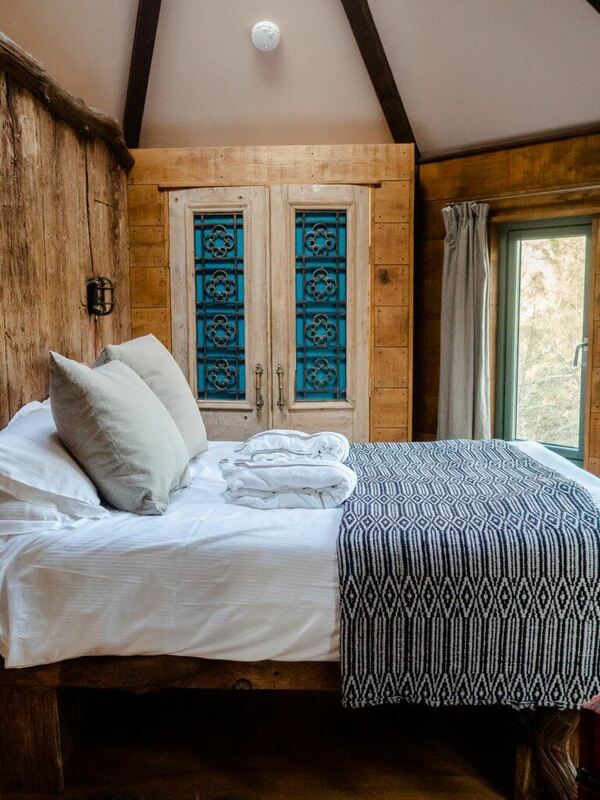 As with the whole ‘sleeping in the wilderness underneath the stars’ theme of every property on the website, Bower Treehouse doesn’t have wifi or a TV (and very little signal! 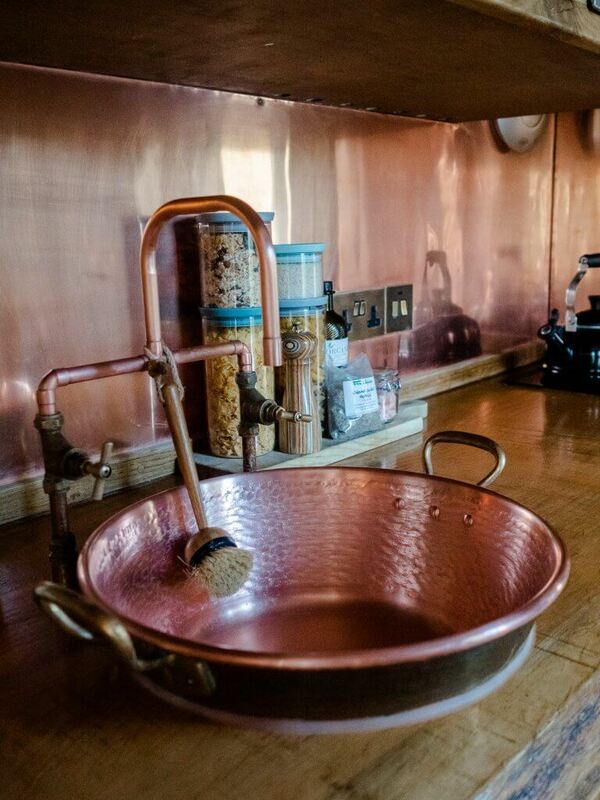 ), making it perfect for a digital detox or romantic retreat. Another feature of all the Canopy and Stars properties is that they all seem very environmentally conscious and eco friendly. From what I’ve heard they are very particular about what accommodations they list on their site, making sure that they are high quality but also share an ethos of sustainability as well. 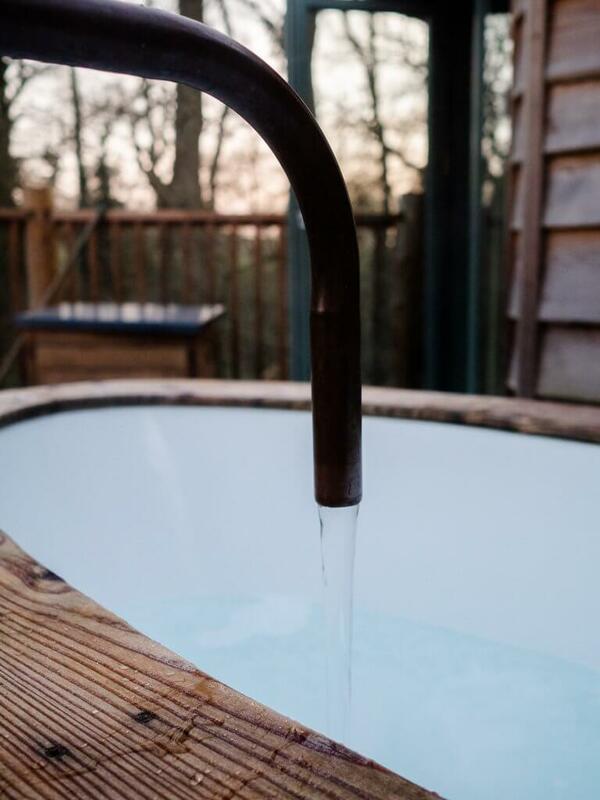 You could see this by all of the little details in the Bower Treehouse – from the compost and eco-friendly cleaning products, to the plastic free utensils and use of natural materials. 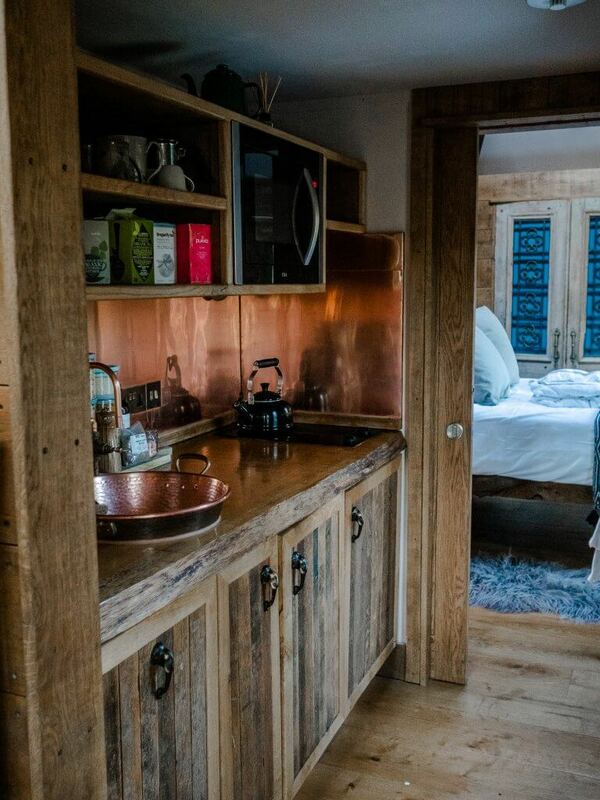 I love all the wood used in the decor; in the bedroom and bathroom in particular they’ve used rustic logs and panelling to really make it feel like you’re inside a tree! Both the living room and bedroom hexagons also had their own skylights too – which meant we could literally fall asleep looking at the stars (but in the luxury of a heated, double glazed bedroom with a comfy mattress!). There were even sleep masks and hot water bottles ready for use too. The kitchen, though compact, had everything we needed – including a fridge, microwave combi oven and even a dish washer! But there were also three different ways to make fresh coffee, as well as plenty of complimentary goodies including pasta, cereal, fresh milk, butter, oil, herbs and a range of teas. They’d really thought of everything! 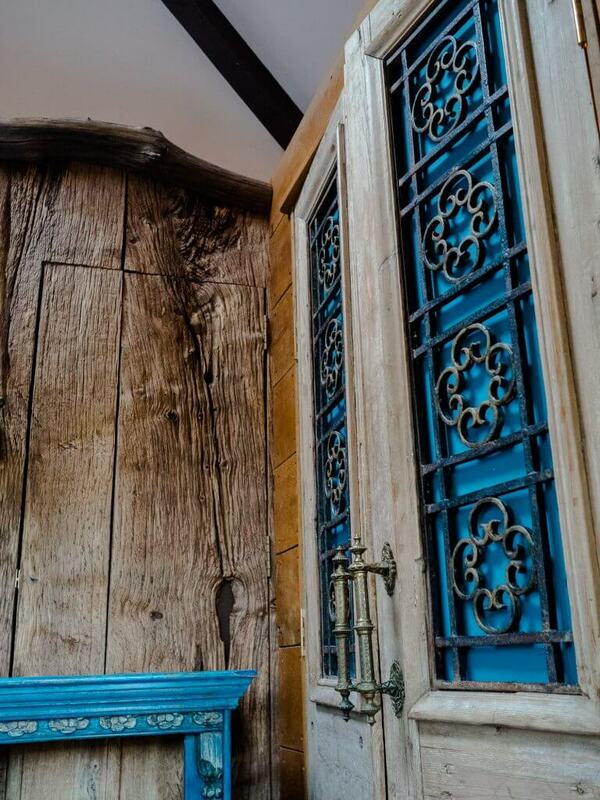 Some of the details in the treehouse definitely had Indian and Asian influences, perhaps from the owners’ travels – including the stunning doors of the wardrobe, which contained a pair of white robes for us to relax in (and head outside to the bath in!). The bathroom was stocked with toiletries for us, including bubble bath (hoorah!). 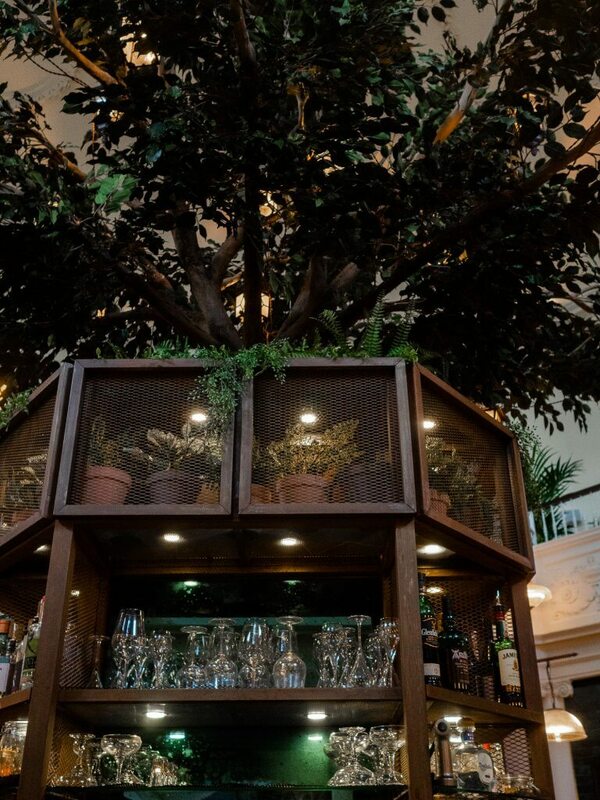 The attention to detail in the treehouse was fantastic; we couldn’t fault it. The owners have really thought of everything, and it made us feel very special. 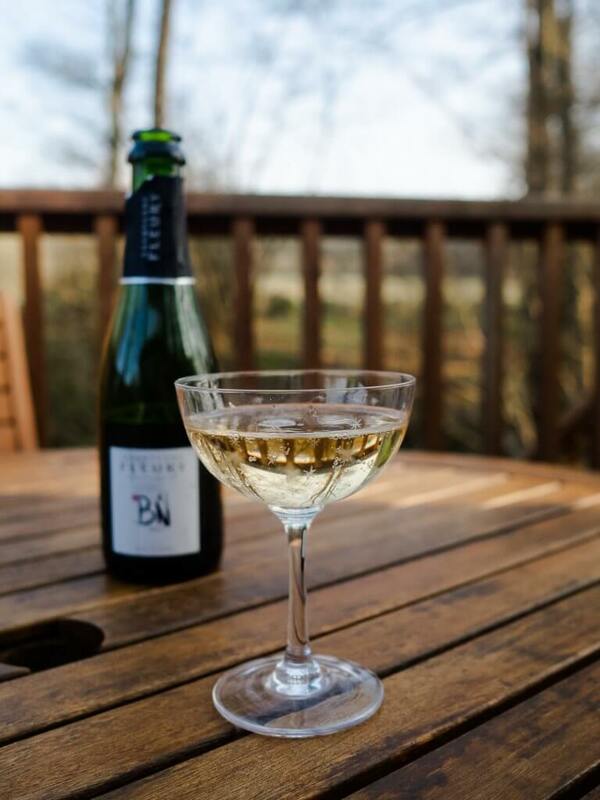 Once we’d explored and taken about a hundred pictures, we opened the fridge to find our complimentary bottle of champagne to celebrate with, and immediately headed out onto the decking to enjoy, surrounded by the peace and quiet of the countryside. 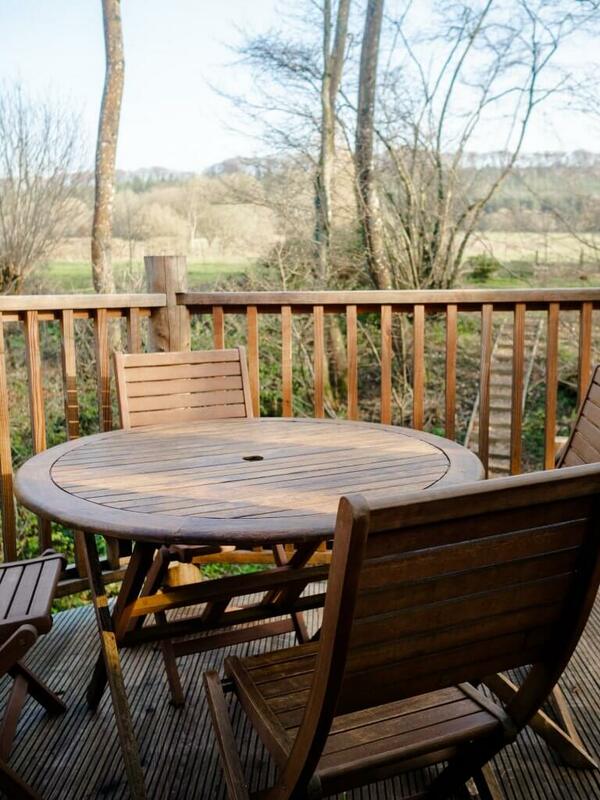 Completely private, the decking had woodland views from all around, and is propped over the stream so all you can hear are the sound of birds and water. A true paradise! Of course we couldn’t resist, and had a bath outdoors as the evening began to fade. I stayed in until it got dark, watching bats fly in the treetops above my head, listening to the sound of absolute silence while Alex lit the fire inside. It really was bliss! 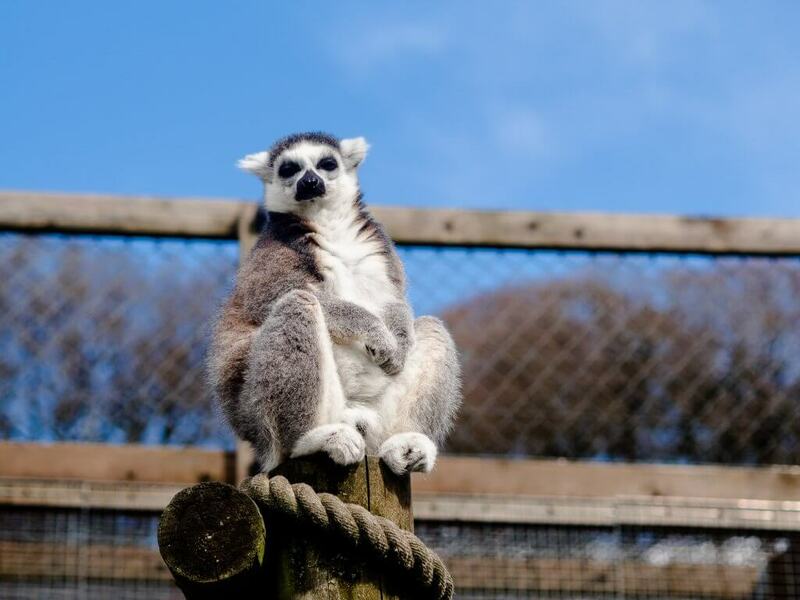 The next day, we had a lazy start (I made Alex a birthday breakfast in bed) and made our way 25 minutes up the road to Longleat House & Safari Park! I’ve been once before during the festival of lights in Winter and had a great time, but I was excited to see it in Spring and (more importantly) see Alex’s reaction. He said he has never been (although his parents ensure me he has) but couldn’t remember it whatsoever so it was basically a new experience for him, and he didn’t really know fully what to expect. If you haven’t ever been before it’s basically like being on a safari but in the UK, on the huge Longleat estate that has been turned into several different enormous enclosures that you can drive through in your own car. 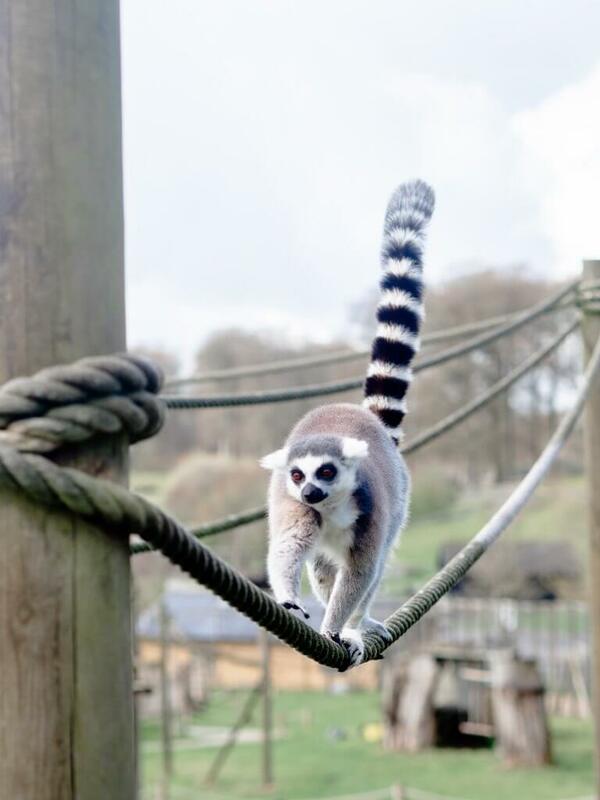 Before you get to the main drive-through safari, there’s the ‘African Village’ section where you can see reptiles, giraffes, and even walk through the lemur enclosure with the lemurs. These ones were swinging right over our heads! Then you get in your car, and drive past zebra, camels and ostriches (we nearly got attacked by a huge ostrich… scary) before coming to the optional gates of the MONKEY ENCLOSURE. It’s optional because these monkeys basically climb all over your car and (if they’re feeling cheeky enough) will pull things off and can cause some serious damage… so it’s only for people who are willing to take that risk. …I still can’t work out if I regretted or loved that decision. 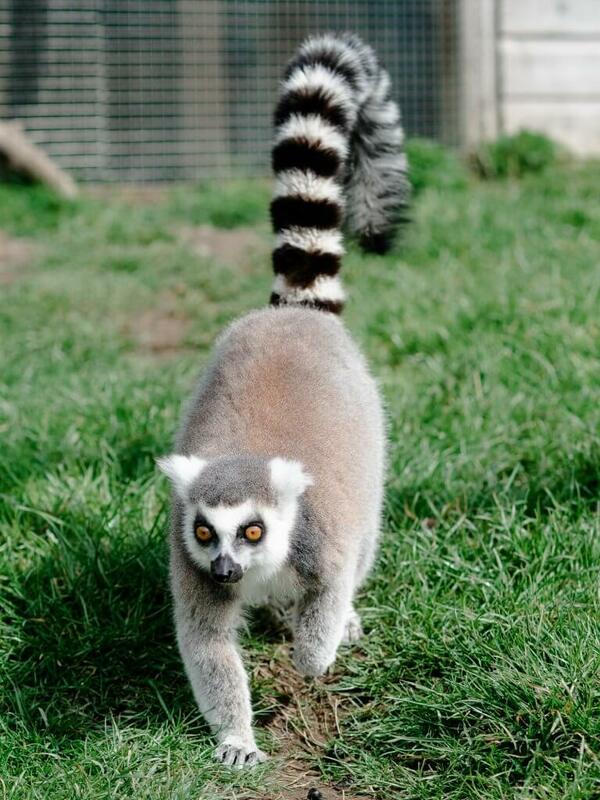 I was driving so didn’t take any photos while we were at Longleat (other than of the lemurs!) but going through the monkey enclosure with a car smothered in crazy monkeys definitely made for some hilarious Instagram and Snapchat videos! Thankfully, other than a few dirty paw prints and one slightly loose screenwash jet, my car made it out alive. Next up it was time to drive through the big cat and predator enclosures! I couldn’t remember from last time whether you could literally just drive straight through next to the animals or if there was some kind of fence, but I can confirm – there’s no fence! Longleat put a lot of trust in the fact that people aren’t going to be silly and will stay in their cars… plus they put a LOT of safety signs up too of course. If you go with kids in the car, I’d highly recommend the child lock. Alex was very impressed, especially when we got to the lion enclosure right at feeding time, so we ended up literally driving past a pride of lions just a few feet away! It was amazing. We also saw wolves and glimpses of a few tigers, and left Longleat buzzing with excitement at being so close to the animals. Alex has been on an actual safari before, and is pretty hard to impress with stuff like this, but he couldn’t stop talking about it and said it really was so much better than he ever expected. JOB DONE! Once we’d finished at Longleat, we drove half an hour across to Bath – one of my favourite cities – and spent a couple of hours walking around the historical center and popping into a few shops here and there. 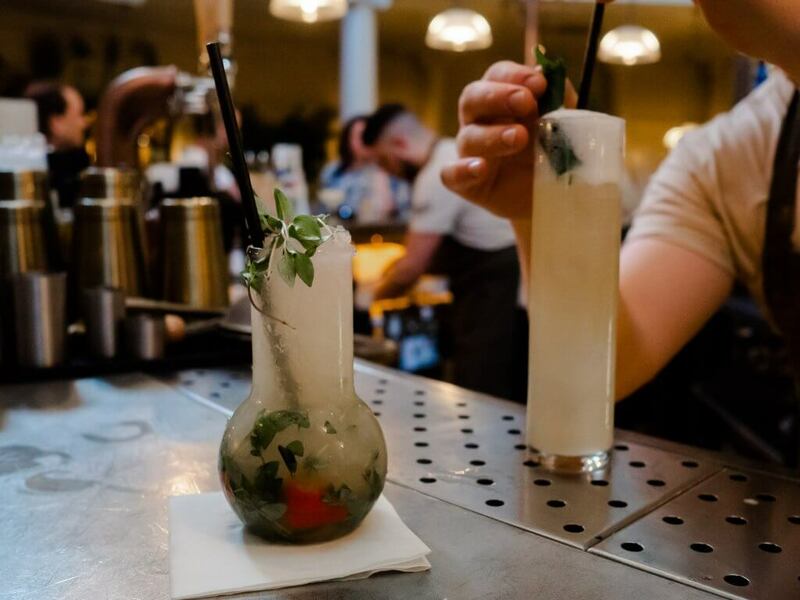 Looking for a cocktail bar, we stumbled across The Botanists – a chain of quirky botanical-inspired cocktail bars and event space that are apparently a large chain across the country… of course, being from Cornwall, we don’t have anything like this, so I had a lot of fun taking Instagram photos of the stunning venue. After our cocktails, we headed over to my favourite Thai restaurant in the country – Thai Balcony. I think my mum told me about it originally, as she used to come up to Bath for Christmas shopping (and she’s a big fan of Thai food), but when I lived in Bristol this was my favourite place to eat when visiting Bath. Alex loves Thai food too, and I was excited to show him my fave place! I didn’t take any pictures of our food sadly, because we were too busy eating, but trust me – it was just as good as I remember! Once we’d eaten, I drove us back to our treehouse in the Somerset forest, and we enjoyed our second and final night in peaceful paradise. The worst part about our trip was leaving, but I know we’ll both remember our time there for many years to come! 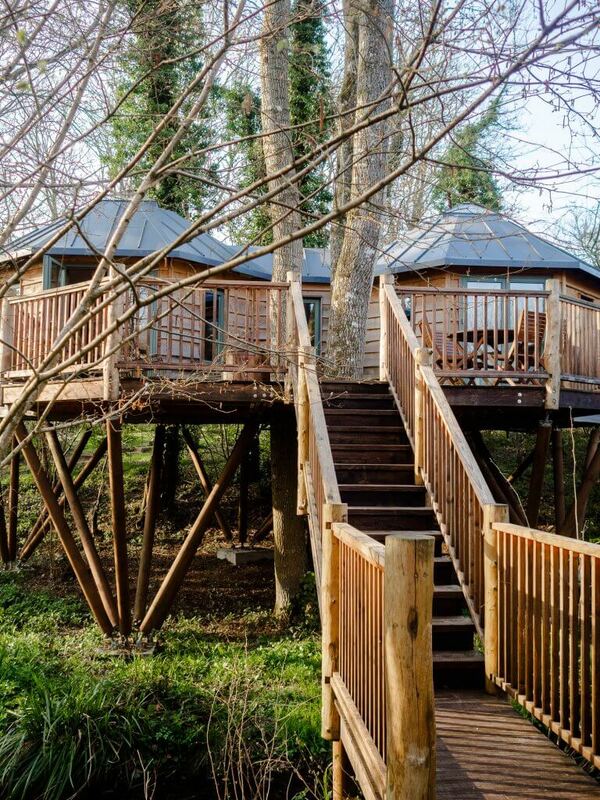 If you’d like to check out and stay in the treehouse we went to, head to their page on the Canopy and Stars website. 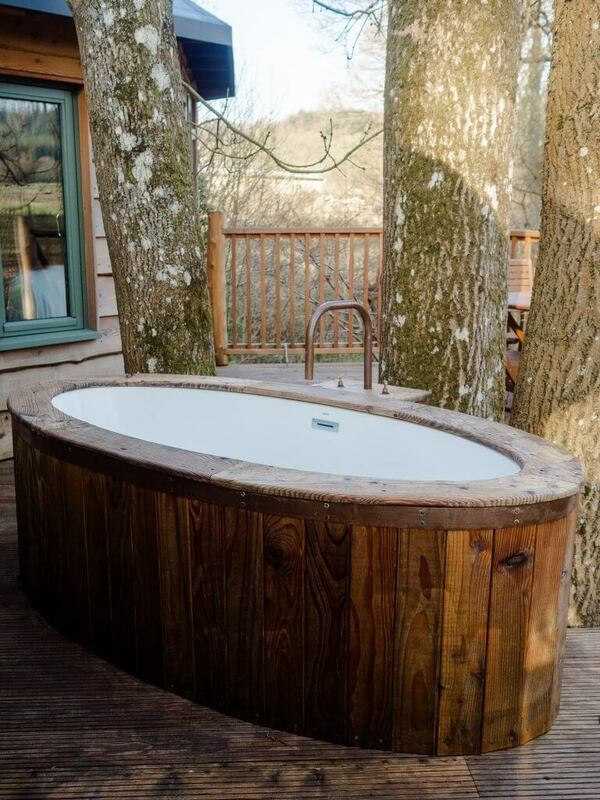 Or take a look throughout their website for more treehouse and wild stay inspiration!